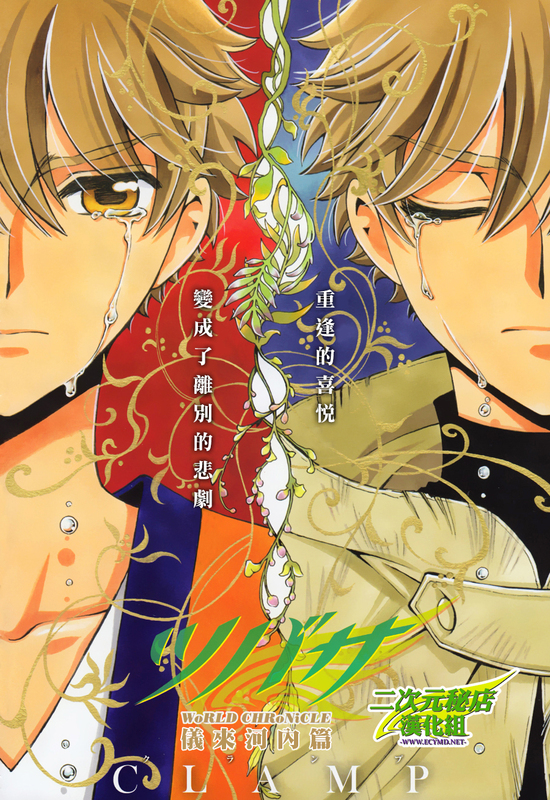 Episode 26 is up for download at CLAMP no Kyoto Agaru Sagaru‘s official website. This episode was pretty much entirely centered in Tsubasa and XXXHOLiC, because the last chapter of Nirai Kanai hen was published this month. Although I’m not secure enough to assume things, it looks like there was a lot of interesting tidbits mentioned by Ohkawa, specially. They also talked about the drawing differences between Watanuki in XXXHOLiC Rei and in Tsubasa (his robe has screentone in Tsubasa) and the difference between Syaoran’s “aa” and “un” answers. It would be really nice if someone could make a quick summary of what was said, specially during the first 15 minutes. Tsubasa – WoRLD CHRoNiCLE – is available for purchase at CD Japan with worldwide shipping. As previously announced by the CLAMP members themselves on their radio show, the third and final volume of Tsubasa – WoRLD CHRoNiCLE – Nirai Kanai hen will have a special limited edition with an audio drama. The story of the audio drama is going to be from the special chapter published in Weekly Shonen Magazine in February 2015. The 16-pages special chapter will come as a booklet so one can follow it as they listen to the audio drama. The audio drama will come in a “Playbutton” (like the one that came with XXXHOLiC Rei #3). The cast will be the same as the TV Anime and OADs. Tsubasa – WoRLD CHRoNiCLE – Nirai Kanai hen #3 will be released on July 15. Episode 23 is up for download at CLAMP no Kyoto Agaru Sagaru‘s official website. It seems like they heard my complains of last week’s episode. This episode had a lot of interesting and foreshadowing info. For the opening talk, they read a message from a listener who wrote saying that their favorite work was Tsubasa and GATE 7 (I think? ), or maybe they liked seeing GATE 7‘s characters in Tsubasa. They asked CLAMP a question and each member replied and I believe it had something to do with people with important historic roles because Nekoi mentioned Iemitsu and Ohkawa mentioned Marie Antoinette — I’m actually curious to find out what she said about her. Next, Mokona read a message from a listener who had bought this month’s Shonen Magazine SPECIAL and they wrote about the Nirai Kanai hen reaching its end, so they asked CLAMP about what would come next and suggested that it could well be a “Kinugawa Onsen hen” — this is because CLAMP went there in the beginning of this year to do some location hunt. 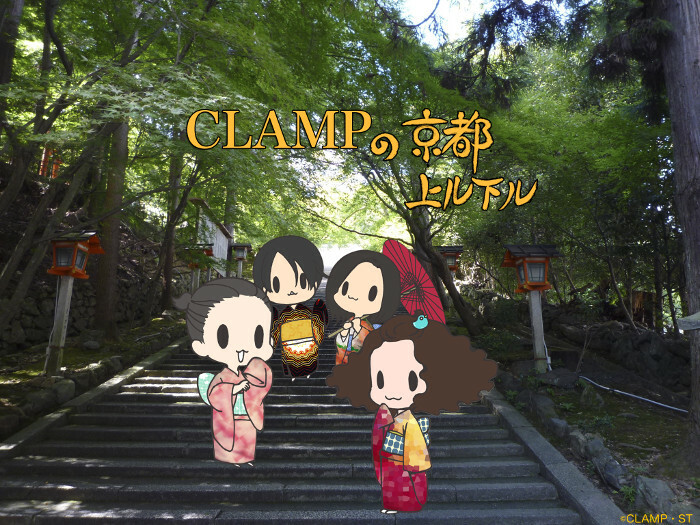 After that, the CLAMP members went crazy wondering about the funny things it could happen with the Tsubasa characters in the hot springs of Kinugawa Onsen (the place is famous for its hot springs). Then, around 8:00 minutes I *think* Ohkawa says that their trip to Kinugawa Onsen was not for the sake of Tsubasa but for the sake of (another) work. But I’m not 100% sure about this. They add that they really enjoyed going there. I’ve seen people tweeting about the final Nirai Kanai hen volume having a few announcements but again, I’m not 100% sure about this. After that, they talked about X for a few minutes! Of course, nothing that we *really* want to hear, but they talked about their characters for a but. Ohkawa joked that Watanuki had been dreaming for 2 months — because that’s how long the manga was on hiatus before the last chapter came out. Then, Ohkawa asked each member to talk something about Tsubasa, something that they missed or they will miss. Mokona said something about action scenes. Ohkawa later asked the other members what other world they would like to see the gang go to next. Mokona said something about angelic world? Not sure here, but after that they all starting playing with the idea of the gang landing in Rayearth‘s world, the real one and not an alternate version of it. They played with the idea of Mokona meeting the real creator Mokona from Rayearth. Mokona said (I think) she would like the gang to land on the otherworld where Ioryogi lives. Ohkawa then says that they already visited the Kobato. world in the TV Anime series (she wrote the script for that episode). They went back to the supposed “Kinugawa Onsen hen” talk and Ohkawa then said “If Kodansha is OK with it, let’s do it”. By the way, their radio show was originally scheduled up to March, but according to CLAMP-NET.COM’s calendar, it’s been renewed for one more month (for now). So it’ll run at least until the end of April (yay!). After that, we’ll see. 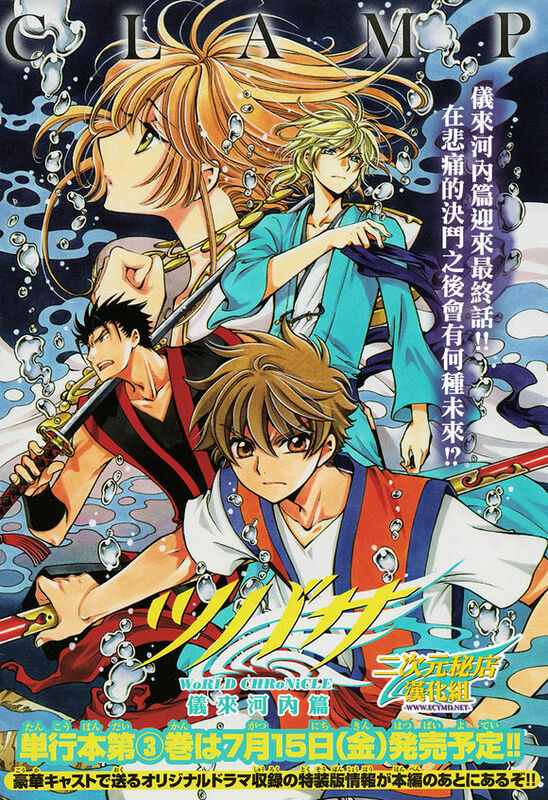 The official website of Shonen Magazine SPECIAL has announced the lineup for its March issue and in it we learn that the next issue will publish the second-to-last chapter of Tsubasa – WoRLD CHRoNiCLE –. The issue will have Tsubasa featuring the magazine front cover and a color opening page is also planned. 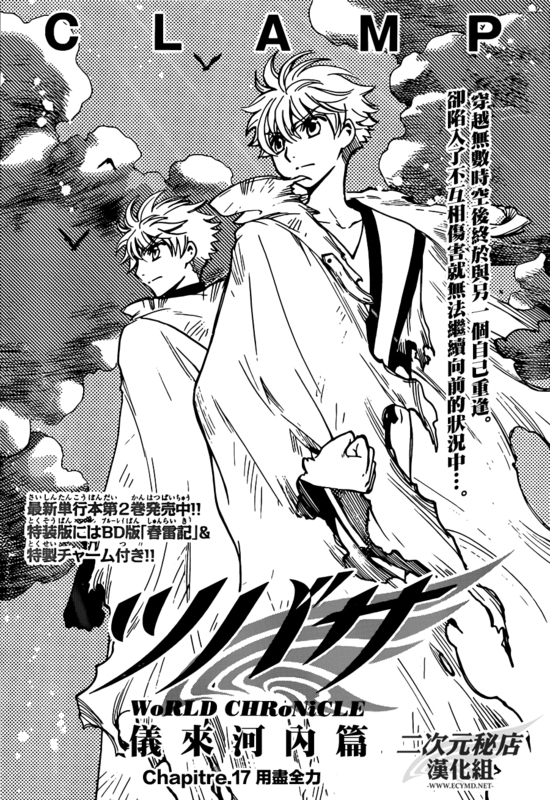 This means we have 3 chapters left for Tsubasa – WoRLD CHRoNiCLE –: the one that is out today and 2 more chapters. Volume 3 shall be the final one for the Nirai Kanai hen arc.